Roche climbed to the very summit of the cycling world when he capped off his Annus Mirabilis with the World Championship win. Like his contemporary Greg Lemond, his boyish looks and baby blue eyes belied a fiercely competitive nature, which was shown best that season when he usurped the leader’s jersey in the Giro from his teammate Roberto Visentini. His resolve and strength of will was again shown in the Tour when he miraculously clawed back a minute and half on Pedro Delgado on the slopes of La Plagne to set up his final victory a few days later. Despite slipping into unconsciousness after he crossed the line, when he came round and was asked if he was alright he was still able to quip, “Yes, but I am not ready for a woman straight away.” The World Championship race was won somewhat fortuitously when Roche, in the mix only to support his team mate Sean Kelly, covered a break that none of the other favourites followed. He broke away again and was able to celebrate his victory. 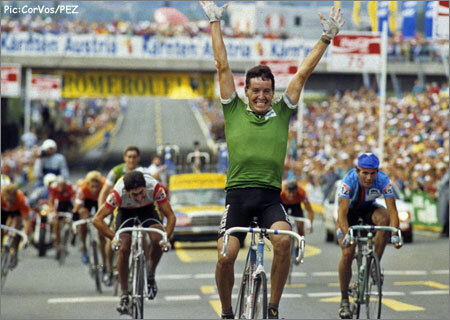 Roche’s Triple Crown can be seen as being won by firstly guile, secondly strength and then with a touch of luck at the end. That sounds about right to me.